The apex court is hearing an appeal after Allahabad high court had in 2010 ruled a three-way division of the disputed 2.77 acre area at Ayodhya among the parties. Supreme Court which commenced hearing in the Ayodhya dispute after hearing arguments from the defendants and Additional Solicitor General (ASG) representing the State of Uttar Pradesh has fixed matter for further hearing on February 8, 2018. A specially constituted bench of Chief Justice Dipak Misra and Justices Ashok Bhushan and Abdul Nazeer was hearing a total of 13 appeals filed against the 2010 judgement of the Allahabad High Court in four civil suits. 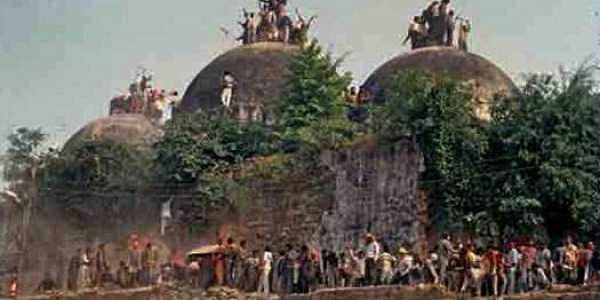 The high court had then ruled a three-way division of the disputed 2.77 acre area at Ayodhya among the parties -- the Sunni Waqf Board, the Nirmohi Akhara and the Lord Ram Lalla. Senior advocate Kapil Sibal representing Sunni Waqf Board, one of the defendants in the case, read out the details of exhibits filed by the contesting defendants before the Allahabad High Court and told the three-judge bench of the Supreme Court that all these exhibits have not been filed before this court and submitted, all the pleadings are not complete. However, Additional Solicitor General (ASG) Tushar Mehta, representing the State of Uttar Pradesh rebutted all the averments of Kapil Sibal. He told SC bench that all the related documents and requisite translation copies are on record. Kapil Sibal then raised doubts over ASG Mehta's assertion that how come more than 19000 pages of documents can be filed in such short time. Sibal then told SC that whenever this matter is heard, there are serious repercussions outside court. He personally requested the court to matter up on July 15, 2019, once all the pleadings are complete. Advocates Kapil Sibal, Rajiv Dhawan along with other petitioner counsels also wanted a larger bench of atleast 7 Judges to hear the Ayodhya dispute matter. A bench after hearing the arguments fixed the dispute for further hearing on February 8, 2018. The bench also asked the Advocates on Record of appeals to sit together and ensure that all the requisite documents are translated, filed and numbered before the apex court Registry. In case of any problem, the counsel were directed to consult the Registry. The bench also took serious note of the submission of senior advocate Kapil Sibal, appearing for one of the parties, that the appeals be heard in July 2019 after completion of the next Lok Sabha polls as the atmosphere at present was not conducive.